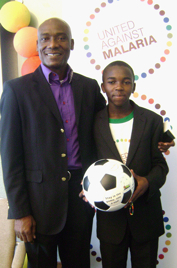 JOHANNESBURG, Dec 2 2009 (IPS) - Growing up in Cameroon, Joseph-Antoine Bell and his friends used to think that by playing football they could get rid of malaria. A member of Cameroon’s national team at three World Cups, Bell survived growing up in a malaria-endemic area; he now sees his childish-ken of football curing the disease materialising into a very real possibility. The “African Goalkeeper of the Century” has joined his winning hands with the United Against Malaria (UAM) campaign. The UAM aims to leverage the world’s love affair with the beautiful game towards forming alliances with football players, their teams, sport officials, governments and fans, towards the goal of ending malaria in Africa. The 2010 Soccer World Cup, which will be held in Africa for the first time, presents a solid opportunity for raising mass awareness of – and taking action against – malaria. Every thirty seconds, a child in Africa dies of malaria. During the ninety minutes each game of the World Cup will last, an average of 180 children will lose their lives to a disease that is both preventable and treatable. “Ninety percent of all global malaria-related deaths occur in Africa, and of that, 85 percent are children under the age of five,” said Herve Verhoosel, external relations manager for the Roll Back malaria Partnership, a founding member of UAM. This children-killer is a driver of poverty on the continent and costs at least 12 billion dollars in direct losses, putting the brakes on economic growth, Verhoosel said. “The world promised Africa that it would end all deaths by malaria in 2015. This is the target,” said Christina Vilupti-Barrineau, campaign manager for the UAM. So how can football fever end malarial fever? “Football is religion. Footballers are heroes on this continent and across the world. When they speak, people will listen,” said Vilupti-Barrineau. Additionally, sport is seen as a promulgator of healthy living, she said. Bell explains. “Football is the most powerful example of building co-operation and building a team to win. It’s not only about the players; it’s also the spectators and officials. Everyone contributes to a good game. Through football we can reach everybody, involve them, make them feel important and get people thinking about what they can do to help fight malaria,” he said. Alongside the likes of Bell and U.S. stars Landon Donovan and Abby Wambach, UAM has chosen Charles Ssali, a 12-year-old Ugandan footballer, as one of its ambassadors. Ssali, a malaria survivor, is on the global UAM launch tour, sharing his message in New York, Brussels and Addis Ababa among other cities. His football skills have seen him play in tournaments in Sweden and Denmark, but he might never have lived to see so much of the world through football had he not survived malaria at the age of four. Ssali now sleeps under a bed-net and encourages his team mates and people he meets to do the same. Malaria can be recurring and Bell said it affected his playing much later on. He put more emphasis, however, on the impact the disease had on his learning as a child. Malaria is the number one cause of absenteeism in endemic areas, impeding on providing universal primary education as a millennium development goal. Of the children who survive cerebral malaria, more than 200,000 per year develop cognitive disabilities later in life, said Vilupti-Barrineau. “This means you’re losing those… who could have gone on to become heroes like Joseph [-Antoine Bell], like Charles [Ssali],” she said. Despite an increase in malaria prevention and treatment funding over the last five years, there are still significant gaps in the regions most affected by the disease. According to the Global Malaria Action Plan, the funding shortfall between 2007 and 2009 was $1.6 billion. The estimated funding available to fight malaria in Africa in 2010 will be approximately $2.68 billion. Bell and Vilupti-Barrineau made strong calls for African leaders to take responsibility. “Africa doesn’t just suffer from one disease. Just because we’re fighting malaria doesn’t mean we’ve forgotten about fighting corruption. If we don’t treat corruption, then the money will not go towards malaria. We need to see results, the same way countries expect their football teams to produce results,” Bell said. For the first time, UAM’s African corporate partners will donate money to the Global Fund to Fight AIDS, Tuberculosis and Malaria. They include the likes of Coca Cola Africa, synthetic fuel manufacturer Sasol, and continental cellphone giants MTN. Other UAM partners are already part of the fight against malaria. Tanzanian textile manufacturers A to Z make life-saving insecticide-treated nets; Sumitomo Chemicals produce the WHO-approved treatment used on the nets, as well as a range of other long-lasting insecticides. South Africa-based fast food chain Nando’s has undertaken to promote a bracelet campaign that will roll out in January of next year. Handmade by women in the Western Cape township of Khayelitsha as part of an employment project for people affected with HIV/AIDS, one dollar from the purchase of every bracelet will go towards the fund. “This is really a historic moment and a monumental contribution. By the end of next year, we aim to donate $1 million to the Global Fund,” said Chris Thorpe, Nando’s general manager. Other corporate partners such as MTN, DSTV channels MNet and Supersport each have their own specialised campaigns to promote awareness. Big Brother Africa producers Endemol undertook to include UAM in the popular reality show, by bringing Ssali onto the show to discuss malaria and make appeals for funding. It was markedly popular among viewers, and one sms sent in to the show declared, “Charles for President.”. When asked about the possibility afterwards, Ssali said he’d much rather play football. This article was first published by Interpress Service News Agency on 02 December 2009.